Radioindy is pleased to announce that we have published our CD Review for Tom Hood and The Trailmen to YouTube.com. 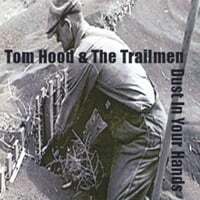 RadioIndy is pleased to present Tom Hood and The Trailmen with a GrIndie Award for the CD "Dust In Your Hands"
If you have been craving some country rooted rock these days then “Dust In Your Hands” by Tom Hood and The Trailmen might be right up your alley. Their lineup of songs sets them apart from most rock acts with the addition of fiddle and mandolin both of which are well blended in the mix. Hood takes on the song “Caught In The Rain” with a very inspired Johnny Cash influence making for a great crossover tune. One of the standout tracks is “Back To The Baja” which features some nice lead guitar work and a bouncy groove that could be heard on any Jimmy Buffett or Traveling Wilburys album. Don’t expect any classic style cowboy tunes on “Dust In Your Hands” because it’s sheer rock/country entertainment. Tom Hood and The Trailmen Press Release on Digg.com! FANS: Increase the popularity of this DIGG press release by visiting our homepage at www.radioindy.com and looking for the "Press Release" section in the lower right. Here, you can find and "DIGG" this press release for Manny Vacchiano. The more DIGGS, the more exposure! DIGG, DIGG IT, DUGG, DIGG THIS, Digg graphics, logos, designs, page headers, button icons, scripts, and other service names are the trademarks of Digg Inc.